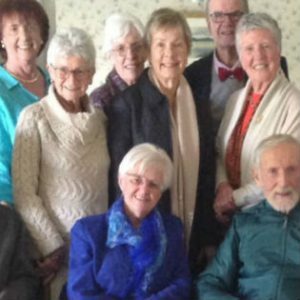 Sr Liz Costigan celebrated her Diamond Jubilee with a small group of Sisters, family and friends at her community of Currajeen. 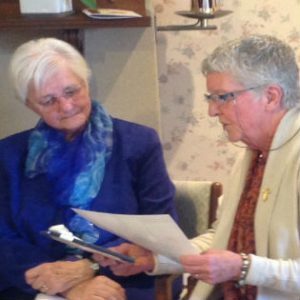 Sr Maureen Delaney wrote this report for the Sisters unable to join Liz to mark the occasion. to me during these 60 years of my religious profession. Religious Sisters of Charity of Australia. Spirit and to keep seeking Christ with all my heart. and in the service of your Church. On Saturday, 5 August 2017, you invited us to celebrate with you, Liz. The occasion, and these words you spoke renewing your 60 years of sacred commitment as Religious Sister of Charity, touched us deeply. Moments of prayerful presence, remembrance, companionship carried us through our celebration of Eucharist in our Currajeen chapel – moving us to quiet tears of joy and gratitude with you, our dear Sister and Friend, grateful for simply being with you. You led us with our Everyday God, into the creating God of Psalm 139 “for the wonder of who I am I praise you, safe in your hands all creation is made new.” We were welcomed in Communion by our loving God: “Do not be afraid I am with you. I have called you each by name. Come follow me. I will bring you home. I love you, and you are mine. Rich memories accompanied your final hymn: Dreaming Free. “I remember well the grace you bring, the power of your love for me./ I remember all the lives that you set free./ I remember well the way you speak my mystery./ Are you ready now to come with me until my dream goes free? This was no ordinary occasion. It was one that carried the impact and witness of faith lived, of lives touched and changed in the experience of crisis, of deep supporting love, and of fidelity lived in Jesus. There were 18 of us gathered – family members, community and friends including our Congregational Leader, Sr Clare Nolan – on a Winter’s morning in Melbourne, that was uplifted in the colours and fragrance of flowers gifted by our Sisters and Friends from across the country and the years. We travelled to the nearby Growling Frog Golf Course Restaurant with an afternoon of sunshine, blue skies and outlook of rolling green greens, in which kangaroos delighted. It was a lovely environment for celebration. In her tribute to Sr Liz, Sr Clare wrote: “Congratulations on reaching 60 years of loving and faithful service as a Sister of Charity. “When I look at your record and appointment listing, I can see that you have certainly been on an extraordinary journey. Primary teacher, principal, novice director, pastoral associate, Congregational leadership, spiritual direction, director of retreats and the RSC companions program. “You have used your talents for the glory of God wherever you felt He was calling you. And in everything was your generous heart. “You are a woman of prayer and deep faith as I always knew, but I saw it recently at close range. God was your rock and your guide. “You are a mentor and a listener to many both lay and religious. You bring the comfort and love of God to so many in lots of ways. You have a special love of teachers wherever you taught and your present ministry still involves making yourself available to the teachers at the Catholic Ladies College and supporting them in their needs. “You are a loving and a trusted friend to many. You show the hospitality of God to all and you rejoice in your vocation. Yu are a true daughter of Mary Aikenhead. “You have a great love of family and you are often the one who gathers family together. No doubt you would be remembering dear Margaret today and missing her presence. How proud and happy she would have been for you today, Liz. 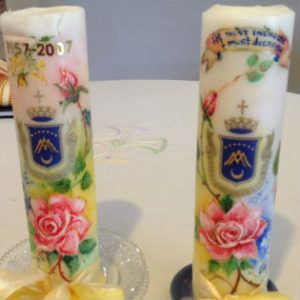 “These few words reflect the richness of your life as a Sister of Charity during 60 years.